Should I get an extra-long (i.e., 11 feet) bridle for my wingsuit rig? In my opinion, no. Based on my personal experience with big wingsuits, a longer bridle only gives you more bridle to accidentally tangle into knots. Bridle entanglements are some of the scariest malfunctions that we know of, and in my opinion I don't want to toss any more bridle into the relative wind than is absolutely necessary. There have been no lab tests to back up this claim of mine, and one day I may be proven wrong by science, but I believe an 8 to 9-foot bridle (measured from bottom pin to PC loop) extends the pilot chute well beyond the most significant part of the burble created by your wingsuit and longer than 9ft is not necessary. If 8-9ft is not enough bridle for you, then you're doing something wrong and you need to work on your flying, not change your gear. The question here should be: "Should I pack my PC correctly and then throw it with certainty and strength and deploy from fast flight?" and my answer is an enthusiastic, "YES!" If you are worried about your PC getting stuck in your burble, then throw it out of your burble into clear air and fly at a speed that will get it inflated quickly so it can do its job immediately. The best way to experience your PC fluttering aimlessly in your wake is to fly your wingsuit slowly and then toss the PC weakly - if your PC ends up in your burble, more than likely this was the cause. With a standard 8-9ft bridle, a firm PC deployment from full flight at a good speed will likely never result in the PC being trapped in your burble. Longer bridles are not necessary but awareness of your PC deployment and flight speed is necessary. As discussed at length in the book, the PC toss is a crucial skill to develop for every aspect of BASE jumping. For wingsuiting, it is perhaps of even greater importance. A violent and imbalanced toss can affect your body position, which can give you an off-heading, and even slight off-heading openings can lead to line twists in a wingsuit. Because of your high horizontal speed and the resulting forward swing of your body during opening, if your canopy opens even a few degrees off-heading then you will inevitably load your risers asymmetrically and rotate under one of the two risers first, into an arcing path that can quickly turn your body and lead to line twists - which in this case are in fact "body twists". 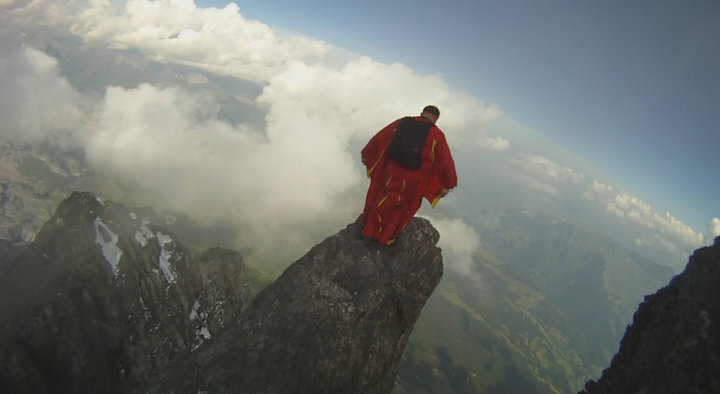 An off-heading with multiple body twists is really annoying in a wingsuit, and the best way to prevent it is to pitch your PC firmly but with great control and awareness of your body position, so as to not damage your balanced position in flight.